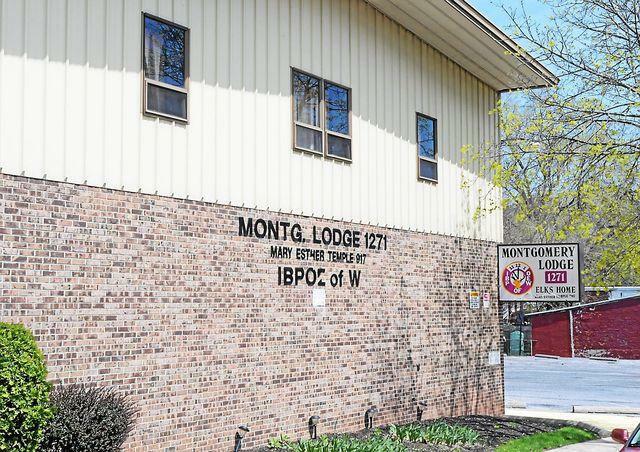 Montgomery Elks Lodge 1271 is located at 605 Walnut St. in Pottstown. 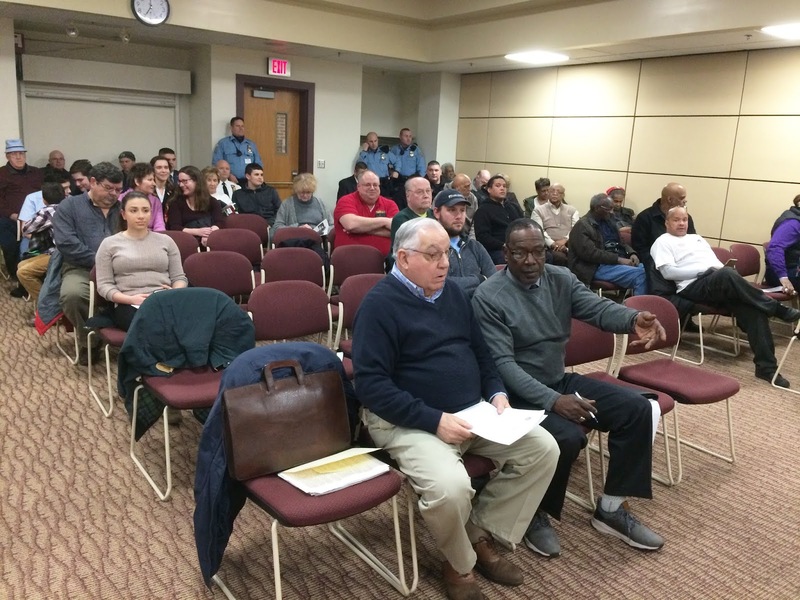 With a pair of 6-1 votes Monday night, Pottstown Borough Council rejected a request for a liquor license made by an Elks lodge with a troubled police history. Councilwoman Rita Paez cast the only votes in favor of allowing Montgomery Elks Lodge No. 1271 to purchase the club liquor license held by Gilbertsville Fire Company No. 1 for $30,000. The club lost its license in 2015 when the high number of police calls to the 605 Walnut St. location led the Pennsylvania Liquor Control board to refuse to renew the club's license. Since that time, the number of police calls to the club, which still rents out its space for BYOB parties, has dropped dramatically, argued Vincent Artis, who spoke on behalf of the lodge. But council members were worried also about the level of disturbance more recently. "If things have changed since 2014, why where there 64 calls in 2015? 16 calls in 2018?" asked Council President Dan Weand. before the Pottstown Borough council meeting gets underway. "In 2016 there were only three calls; in 2017, there were eight and 16 in 2018," said Artis noting not all calls may have found a problem. "There was a trend downwards after we put our action plan in place." But Councilman Joe Kirkland, who represents the Ward where the lodge is located, said neighbors of the club with whom he spoke were concerned about disturbances as recently as two weeks ago. "I spoke with neighbors who said there was a fight there two weeks ago that ended up with two guys fighting on top of a car," Kirkland said. He said he supports the lodge's philanthropic efforts and says if they could have an entire summer without incidents, he could support a request and the neighborhood might be more receptive as well. "I have to represent my constituents who live in the neighborhood and my constituents are concerned," Kirkland said. He also rejected the suggestion made at Wednesday night's work session that Council was opposed to the liquor license request because the Elks Club membership is primarily African American. "I disagree with the assessment that this is a black and white issue. The people I talked to in the neighborhood are all black," Kirkland said. 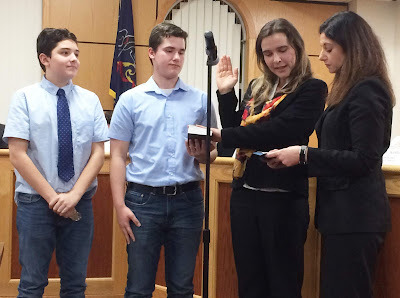 Above, Pottstown Mayor Stephanie Henrick, right, swears in the borough's newest police officer, Andrea Sovari, while two young men we will presume are her sons and Police Chief Michael Markovich and Captain Robert Thomas look on. At right, Sovari takes the police officer's oath. Council swore in a new member of the police department Monday night, with Mayor Stephanie Henrick issuing the oath of office to Andrea Sovari. Several Pottstown officers were in attendance for the ceremony. Council heard from Carousel at Pottstown Board President Jim Arms that plans for expansion of the building will be submitted shortly. A short-time later, council unanimously approved a three-year lease of the Mantawny Green Mini-Golf Course to the Carousel. The carousel group will operate the mini-golf course in the hope that economies of scale can reverse the financial losses the course has incurred under the borough's control. As part of the lease, the Carousel will make $12,000 worth of improvements and upgrades to the four-year-old course which Borough Manager Justin Keller said last week has been criticized as being "a little sterile." Borough Council also unanimously approved a request for a transfer of $30,000 in the Borough Street Tree Fund to the Pottstown Tree Fund, under the director of former Shade Tree Commission Chairman Thomas Hylton. Now both a member of the planning commission and the Pottstown School Board, Hylton and his wife Frances have spent upwards of $250,000 of their own money caring for Pottstown's street trees ever since council dissolved the Shade Tree Commission in 2010 and stopped budgeting money for their care. However, the borough does collect funds from developers who would rather pay for a tree to be planted somewhere else than at their new development. It is this money which the borough has been collecting and not using that the Pottstown Tree Fund will now use to maintain street trees on High, King, Hanover and Beech streets, according to a proposal Hylton made to council at the Feb. 6 meeting. It will also remove dead trees and treat ash trees in the public right of way to resist the emerald ash borer, an invasive insect species. would be eliminated under the changes being proposed. With another unanimous vote, council authorized Borough Solicitor Charles D. Garner Jr. to prepare and advertise amendments to the downtown zoning district ordinance to allow outdoor dining. 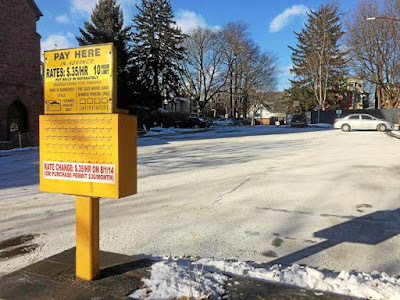 A second vote, similarly unanimous, authorized Garner to advertise the borough's master traffic ordinance to establish digitally metered off-street and on-street parking. According to the draft ordinance, the rate in borough parking lots would be raised from 35 cents per hour to 50 cents per hour, a 43 percent increase. On High and King Streets, which current have three hours of free parking, the change would allow only one hour of free parking, and 50 cents per hour thereafter. The last time some of these changes were discussed was June. You can read about those discussion here. 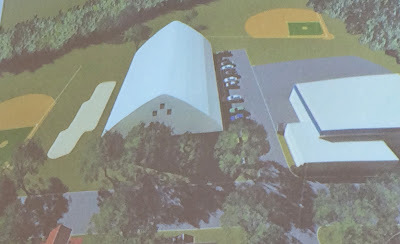 An artist's rendering of the new tennis dome at Maple Street Park. 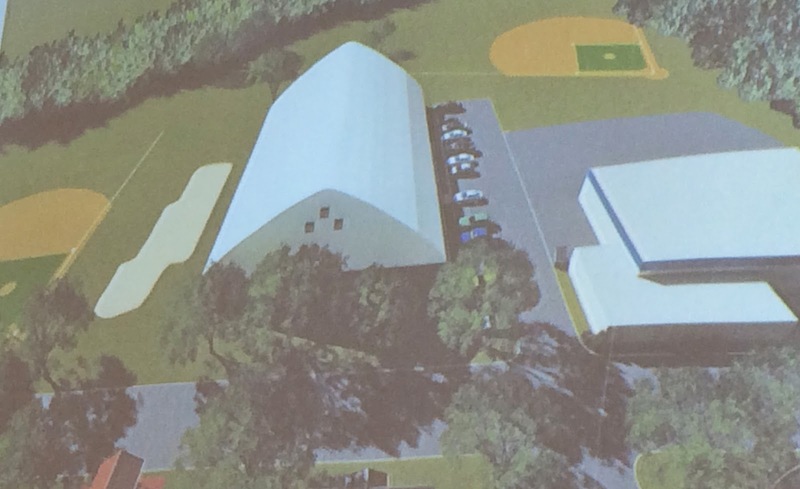 Council unanimously authorized a change to a lease agreement with Greater Pottstown Tennis and Learning to allow a structured, instead of inflated, tennis enclosure at Maple Street Park. The non-profit group also plans to add a third court. This will allow for year-round tennis, which will also be open to the public at specific times. Nationmal Heritage Area, outlines her requests Feb. 6. Borough council unanimously approved a request by the Schuylkill River Greenway group to paint, with the public's input and help, a mural on the surface of the Schuylkill River Trail where in Riverfront Park. 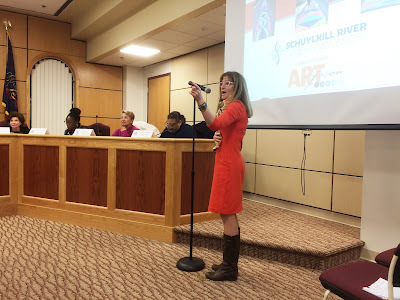 The borough's zoning ordinance considers the ground mural to be a sign and council waived those ordinance requirements to allow the mural to be designed and painted by April 27. Two public meetings on what the design should look like will be held from 6 to 7:30 p.m. on March 7 at first Presvbyterian Church, 750 N. Evans St.; and March 20 at ArtFusion 19464, 341 Beech St..
On the beer side of the equation, council also approved a request by Greenways to host a Parks on Tap event at Riverfront Park from June 26 to June 30. And last but not least, council voted 5-2 to adopt, over the consistent objections of attorney Michael Mauger and Council members Joe Kirkland and Rita Paez, the policies and procedures governing Pottstown's new Land Bank. put into the hands of a qualified developer. Mauger has spoken publicly that the rules allow the board of the land bank too much discretion in who it sells the land it obtains to, saying there should be more control to prevent conflict of interest. Kirkland and Paez have both objected to the presence on the land bank board of officers of other non-profit agencies that obtain land, saying it could give them an unfair advantage. 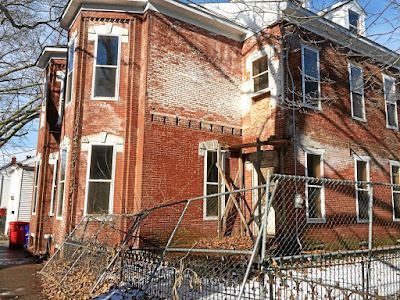 The law was adopted in November, 2017 the land bank is designed to make it easier to get control of blighted properties, of which Pottstown has a bumper crop, and get them quickly into the hands of developers interested in fixing them up or tearing them down and replacing them, thus getting them back on the tax rolls. 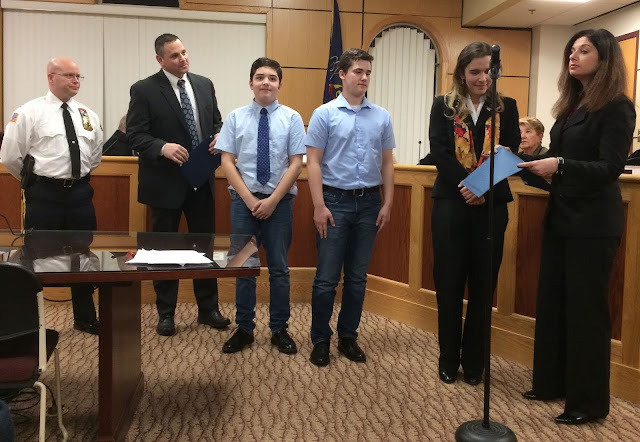 It has taken until now to name a board, set the rules and policies and set up an intergovernmental agreement with the county, school board and borough council. Council adopted that agreement last night. And with that oh doughty reader, who has stuck with me all the way to the end of this lengthy treatise, I present to you, the Tweets from last night's meeting. This is an amazingly comprehensive piece. Well done, good sir!